Updated 7 March 2017, with the withdrawal of Chem3D I thought it might be useful to update this review. There are a wide selection of Molecule Viewers for mobile devices and I've tried to highlight a selection that will cater for differing needs. A publication Structural Genomics: General Applications, Methods in Molecular Biology DOI compared a variety of mobile apps for displaying macromolecular structures. Whilst useful I can’t help but feel that viewing all molecules from small molecule drugs to large biomolecules ought to be the objective. In this compilation I’ve also included those apps that can act in a client/server mode to provide more computationally intensive options however since I don’t have access to the server I can only really look at the client. I think that the client/server model is particularly interesting and it will be interesting to see how this develops. I also included some apps that were released since the manuscript was submitted. I’ve tested the apps on an iPad , whilst they should all run on an iPhone, and I did try some apps, I’m not sure you would want to do it full time. Sharing files can be an issue on a mobile device so I’ve highlighted those with dropbox integration. The other advantage of a web page is that it is relatively easy to update. 3d-molecules-edit and drill is designed to enable students to build, construct, modify and examine molecules in 3D. 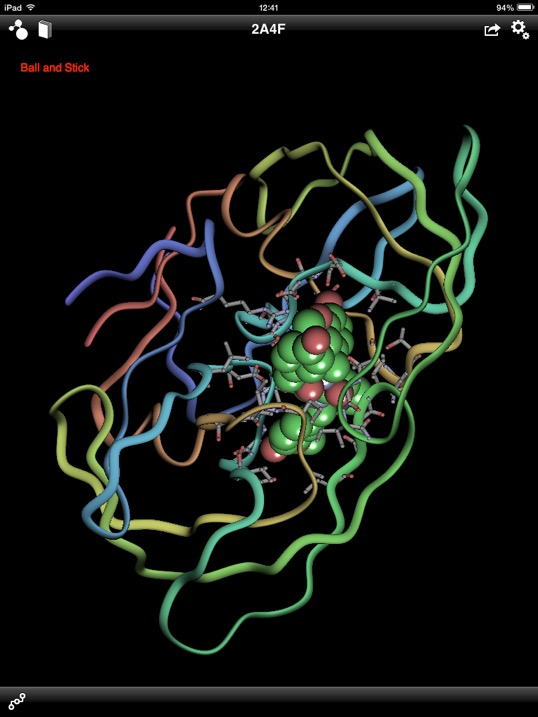 It can open/save molecules in PDB or SDF format. The user can also use the app to build organic or inorganic molecules, structures can be displayed in ball and stick, stick or CPK styles, there appears to be no option to display cartoon/ribbon models for biomolecules. Resulting files can be shared by email or Dropbox. Support seems to be via a Facebook group. Ball and Stick is a viewer that allows you to download PDB files and display 3D structures. For ligands in proteins the ligand, protein, ions and solvent can be displayed independently in various styles (wireframe, stick, ball and stick, space-filling), there is also the option to display the protein in ribbon format with the side-chains around the ligand only rendered. The displayed image can be shared with other Ball and Stick users but there is not the option to save to Dropbox or send via email. The user can rotate, translate or zoom using standard iPad gestures. Chem3D for iPad Now withdrawn can import RCSB PDB files, Molfile and C3XML, there are a number of viewing options (ball and stick, wireframe, cartoon, space filling, rocking), Sheets, Helices, Ribbons and the user can control rotation of molecule. 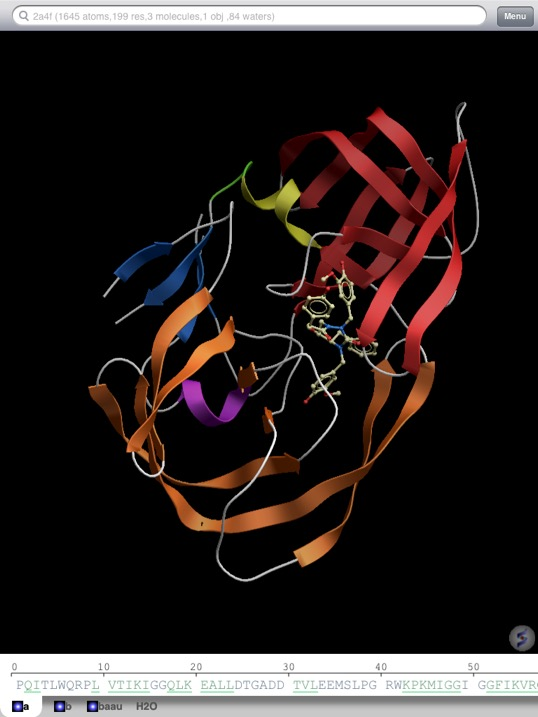 However it seems that if you display the protein in ribbon format the ligand is no longer displayed. The structure can be rotated, translated or zoom using standard iPad gestures and the file can be shared using a variety of options as shown below. This includes the “flick to share” and you can also save in a format suitable for 3D printing. ChemDoodle Mobile companion to the popular chemical publishing desktop application, ChemDoodle and is accessed with your ChemDoodle account that is provided to you for free when you purchase ChemDoodle desktop, instructions are here. Unfortunately there does not appear an option to save the password. ChemDoodle Mobile is a calculator for drawn organic structures. There are five main windows: Draw, 3D, Calculate, Spectra and Help. The Draw window shows a typical ChemDoodle sketcher, where you can draw or download and save your structures. At the moment structures can only be saved in your ChemDoodle account and there is no option to use Dropbox. The 3D window allows you to view the drawn molecule in 3D, while this is excellent for small molecules it does not have the sophisticated rendering options needed for large macromolecules. The Calculate page calculates properties and the Spectra page simulates NMR spectra. All spectra are interactive. CMol, only starts in landscape mode, I didn’t find that intuitive to use at first but fortunately there is excellent online help. Setting up the display requires the user to define selections using a series of filters. You can then manipulate the display of each selection independently. 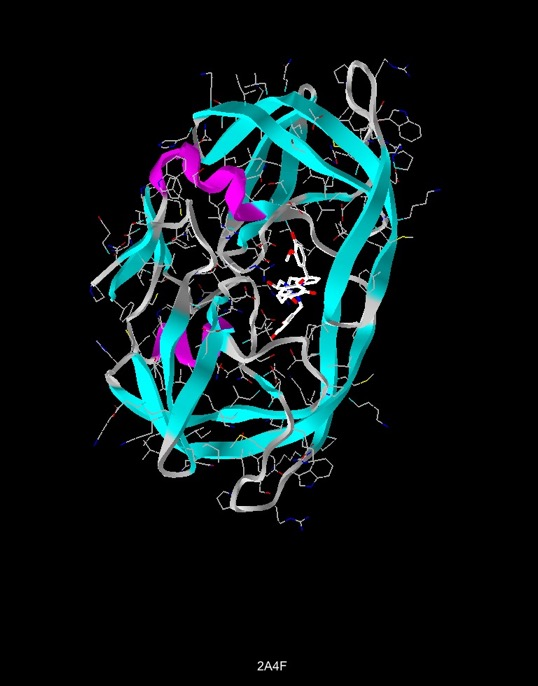 I thought the rendering of proteins in ribbon style was less polished compared to some of the other apps. There are no options for saving or sharing files. CrystMolPad displays crystal and molecular structures as atoms in various display styles, including ball and stick, space filling, and stick styles. Structures are represented as atoms and bonds in three-dimensions. Both isolated molecules and crystal structures are supported. CueMol viewer is an interactive macromolecular viewer for structural biologists. CueMol viewer allows the users to open and view the scene files made by the desktop version of CueMol, and the Protein Data Bank (PDB) format files. There are limited rendering options probably because this app is more intended to act as an iPad viewer for the desktop application which can be used to create views which can then be transferred to the iPad. There are no options for saving or sharing files. FinMol allows you to fluently download, view, manipulate, and present macromolecules, including protein, DNA, RNA or any other structures that are in protein databank(PDB) format (but not other file types), structures need to be downloaded using Safari (or other apps). You can move, room, and rotate object using finger gestures. Inspection or selection of your molecule composition is as simple as tapping on the screen or using the easy-to-use browser. The ligand, protein, ions and solvent can be displayed independently in various styles (wireframe, stick, ball and stick, space-filling and ribbon). It is possible to precisely define the display to create a scene that can be saved. There are no options for saving or sharing files. iMolview There is also a free version iMolview Lite which is the one I looked at. The app has a direct link to the Protein Data Bank (PDB) and DrugBank, by simply typing queries into the text box at the top of the screen. You can also Read in your own MolSoft ICM *.icb files. Structure files (pdb/icb) can be shared by sync with iTunes, there is no Dropbox integration. You can move, room, and rotate object using finger gestures, and the can be customised with a variety of molecular representations (wires, balls-and-sticks, space filling, ribbon diagrams, molecular surfaces) and various colouring schemes. The latest update of iMolview includes Anaglyph stereo mode (Set 'Stereo Type' to 'Anaglyph' in Tools menu), any red-cyan 3D glasses will work in this mode and there is also an option to download download crystallographic data for the currently loaded object. iMolview appears to be under very active development but I’m not sure how many (or how rapidly) of the features will be incorporated into the lite version. iPharosDreams is a viewer that allows you to download PDB files and display 3D structures, there are limited display styles but the focus of the app is pharmacophore selection. 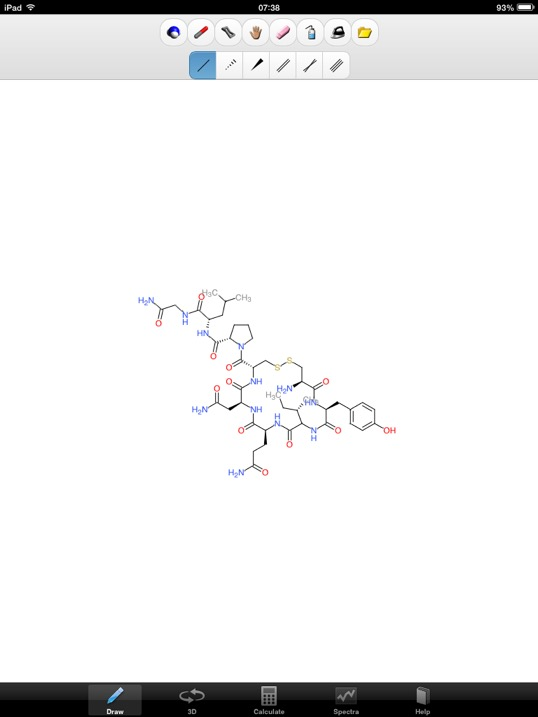 After selecting the ligand it is then possible to map the binding site and generate a pharmacophore. The user can rotate, translate or zoom using standard iPad gestures. I did try to get more information via the support contact but got no response. iSpartan Molecules are created by two-dimensional sketching, analogous to drawing a structure on paper. The app converts the two-dimensional sketch into a three-dimensional structure. iSpartan uses the proven MMFF force field and performs conformational searching in real time. A range of molecular properties can be calculated including chirality, Molecular weight, Total surface area and polar surface area, Molecular volume, Log P, Vicinal coupling constants and Distances, angles, and torsion angles. Spectra and other properties calculated using quantum mechanics are available for the 5,000 molecules in the database that is included with iSpartan. The link to the iSpartan serveralso provides access to NMR and IR prediction, Molecular orbitals and electrostatic potential maps, and a range of thermodynamic calculations. For common organic molecules, quantum chemistry calculations can be carried out if the iSpartan Server program is installed (separate product; available for Windows or Macintosh). 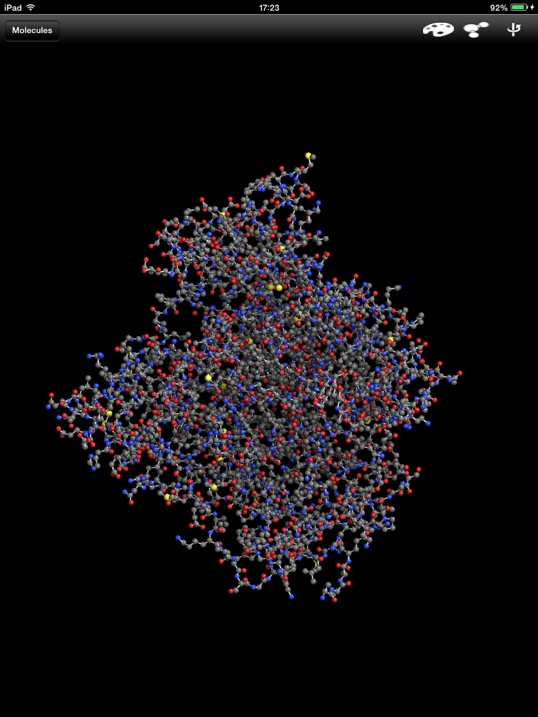 Mobile HyperChem Level 1 is a limited version of Professional HyperChem, a well-known molecular modeling program for the Mac, Linux, and Windows. There is also a rather limited but free version Mobile HyperChem Free This free version allows you to create, display, and manipulate molecular structures. It does not allow calculations nor does it have the ability to send computations to a Server Version of Professional HyperChem. Nor does it allow bidirectional transfer of molecules from a Professional HyperChem server as does the Level 1 product. To be honest the real attraction of Mobile HyperChem really lies with the network interaction between the mobile client and the HyperChem server which allows you to transfer molecules in either direction and read output files from the server onto the mobile client for inspection. The client controls the server by sending it script commands from a set of hundreds of such commands that control a server's operations. The mobile client can save molecules, scripts, and result files in its local storage and at any time these can be used to perform molecular modelling calculations in association with the server. WebMO allows users to build and view molecules in 3-D, visualize orbitals and symmetry elements, lookup chemical information and properties from external databases, and access state-of-the-art computational chemistry programs. 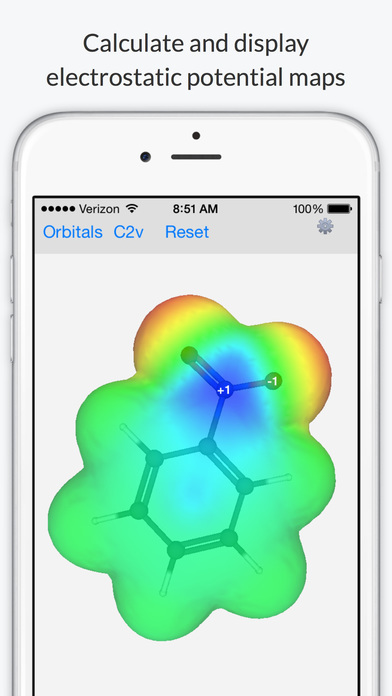 WebMO is recommended for students and faculty in high school, college, and graduate school who desire mobile access to molecular structures, information, and calculations. 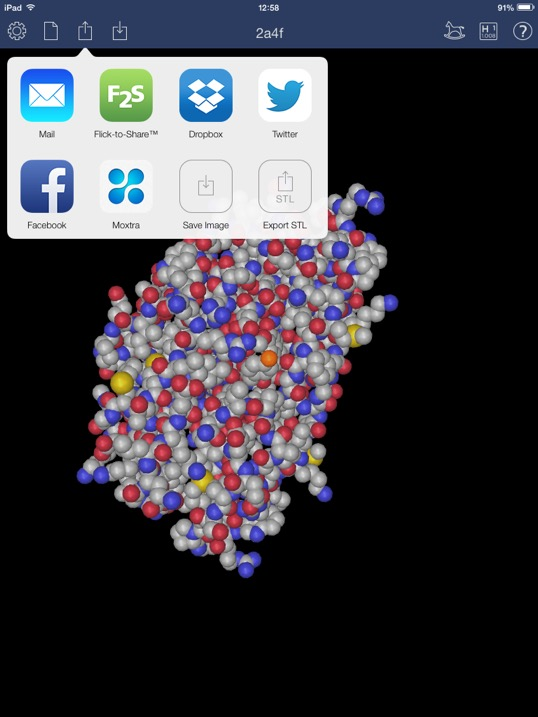 Molecules can be downloaded from either the RCSB Protein Data Bank or PubChem, they can then be manipulated using your fingers. You can rotate the molecules by moving your finger across the display, zoom in or out by using two-finger pinch gestures, or pan the molecule by moving two fingers across the screen at once. These structures can be viewed in both ball-and-stick and spacefilling visualization styles, but not ribbon. There no means to select the ligand and display in a different rendering style. Custom molecule structures can also be downloaded to the device from any publicly available web server. The location of these structures can either be manually specified in the application, or custom URLs, such as molecules://www.sunsetlakesoftware.com/sites/default/files/neonPump.pdb.gz , can be clicked on within Safari or Mail on the device. This will launch Molecules and have it start downloading the file at that address. Molecules is free and its source code is available under the BSD license. Molecule World Created with funding from the National Science Foundation, and an Innovation Award from Shoreline Community College, Molecule World™ is the perfect tool for learning about molecules and their properties and the best tool for teachers who wish to use molecular and chemical modeling in class. As far as I can tell, users can download and view molecules from the NCBI, PDB or PubChem, but not load their own files. PyMOL can display proteins, nucleic acids, and other chemical structures in a wide variety of representations: lines, sticks, ball-and-stick, spheres/CPK, ribbons, cartoons, putty, meshes, and surfaces. You can search for and download structures from the PDB, PubChem, and your own Dropbox folder. 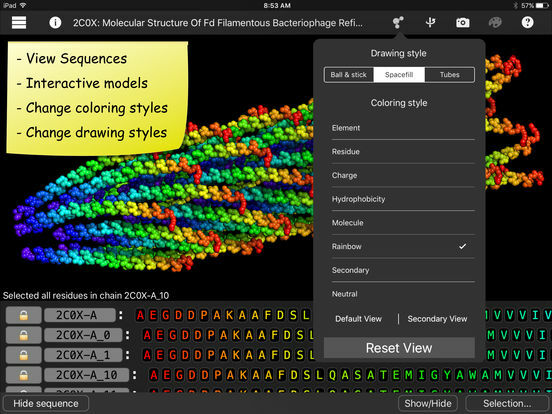 PyMOL on the iPad supports a variety of common structure formats, including PDB, SDF, MOL, MOL2, PSE. PSE (PyMOL session) is the native format of the PyMOL Desktop application and can contain styled molecules and provides a nice way to share structural analysis results created with the desktop application. For ligands in proteins, the ligand, protein, ions and solvent can be displayed independently in various styles (including wireframe, stick, ball and stick, space-filling), there is also the option to display the protein in cartoon format. The objects can be coloured by object, chain, secondary structure etc. The ligand site can also be defined by a surface, with key interactions highlighted as shown below. 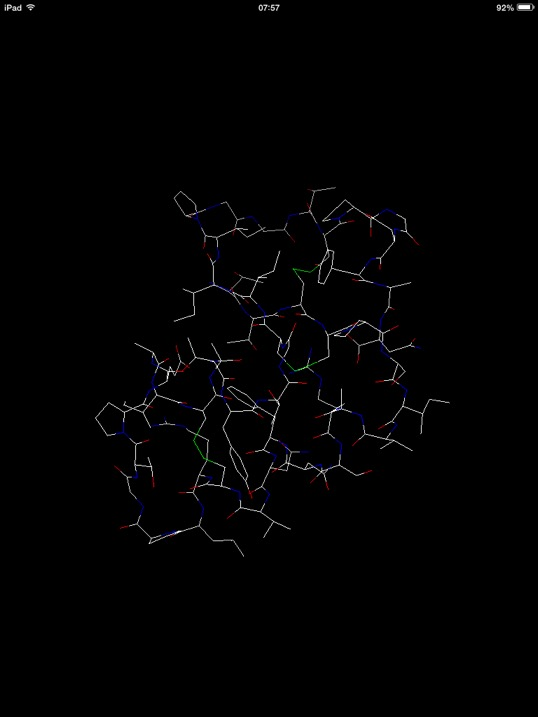 PyMOL also supports anaglyph stereo and views can be copied to the clipboard, Dropbox or Photos, however I don’t think you can save the molecular structure to your Dropbox or share them by email. You can select atoms, residues, chains, molecules, measure angles and distances etc. The user can rotate, translate or zoom using standard iPad gestures. PyMOL also does structural alignments (select two objects and long-press for a context menu).The graphics are really excellent but there have been reported memory demand issues on the support forum. The custom URL can be used by other iOS apps or used within a web page opened in Mobile Safari. You can share using email, Twitter of FaceBook, but not Dropbox. For ligands in proteins the ligand, protein, ions and solvent can be displayed independently in various styles (including wireframe, stick, ball and stick, space-filling), there is also the option to display the protein in cartoon format. Colouring by chain, secondary structure, polar/non-polar or B-factor is available, but there is no option to specify the colouring scheme for the ligand. You can take snapshots of the screen which are automaticly imported into Photos. 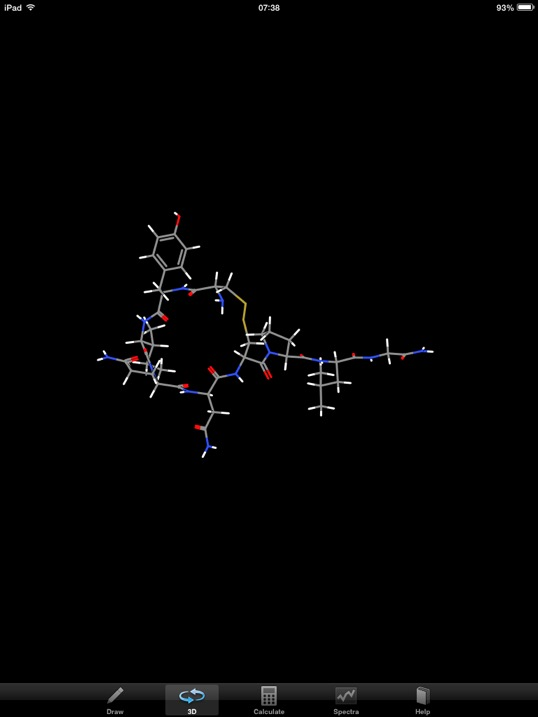 With the increasing interest in virtual reality it is great to see this coming to molecule viewers Learning MacroMols VR is a mobile app where you can experience macromolecules such as DNA, RNA, carbohydrates and protein structures (from the PDB – Protein Data Bank) in a virtual reality, using Google Cardboards. Macromolecules typically contain hundreds of atoms, in smaller subunits called monomers. PROtein VR requires a VR Google Cardboard headset with head straps and a Bluetooth gamepad (MFi certified - made for iPhone). 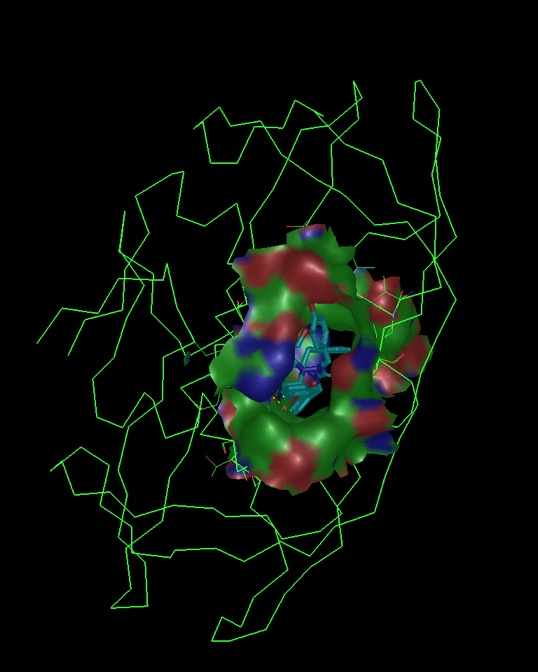 You can directly download experimental X-ray diffraction crystallographic 3D molecular structures from the Protein Data Bank (http://www.rcsb.org). Insert simply a PDB id and press download (for example 3UZA).